A living wall and planters from a Chelsea Flower Show award-winning garden sponsored by the University have been unveiled on campus. Social enterprise River of Flowers’ Honeycomb Meadow Bee Garden, co-designed by Kerrie McKinnon and Gaby Evans of Studio SuperNatural, features 30 pollinator-friendly wildflower types like Self-heal (Prunella vulgaris), Vipers Bugloss (Echium vulgare) and Knapweeds. 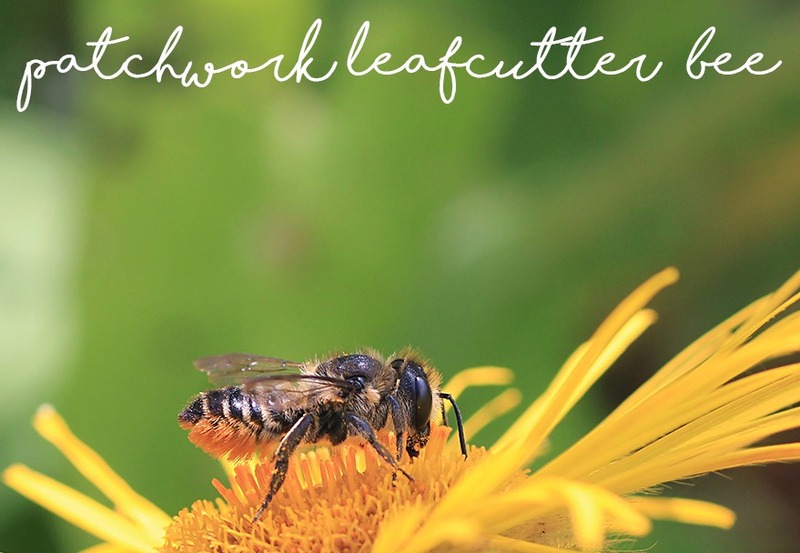 The garden is intended to provide food and shelter for and raise awareness about solitary bees - representing more than 90% of the UK’s bee species, such as the Hairy-Footed Flower Bee, Leafcutter Bees and Mason Bees - which lay their eggs in cavities and live alone rather than in a hive. 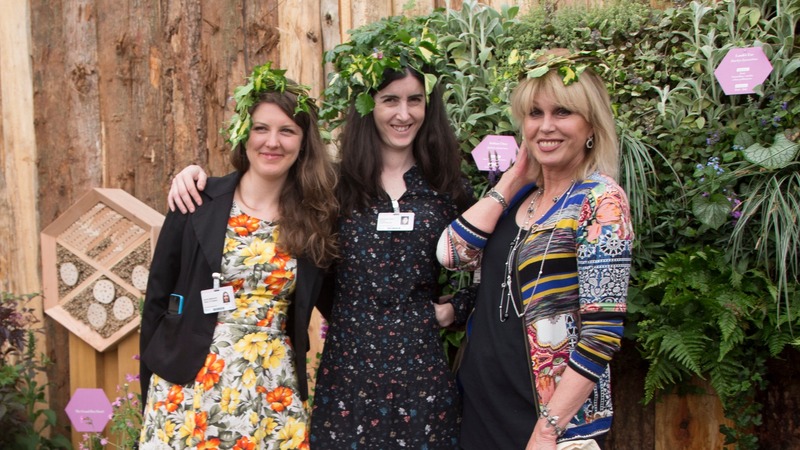 The bee garden won a silver medal at Chelsea in May, where it was visited by Joanna Lumley, Piers Morgan, Dermot O’Leary, Simple Minds singer Sarah Brown, gardening journalist Alys Fowler and artist, entrepreneur and Bee Lovely campaigner Sam Roddick. “This garden is a celebration of all that is humble and often looked over” said Roddick. “If we have happy bees we then have the potential of a happy life. They are busy pollinating for us - gifting us food, health, beauty and delighting our senses”. "This garden is a celebration of all that is humble and often looked over. If we have happy bees we then have the potential of a happy life"
"We've lost 97% of our wildflower-rich grasslands since 1945 through modern agriculture and urban development depriving pollinators of food and nesting sites” says Alison Benjamin of Urban Bees, a key partner of River of Flowers. “With every three mouthfuls we eat reliant on insect pollination, scientists have warned we’re on course for ‘ecological Armageddon’. The living wall has been installed in the University’s Wellbeing Garden, recently created in the grounds of Sunny Hill House on the north side of the campus as a quiet contemplative space for all students and staff, and particularly for those seeking a break from the stresses of daily life. It is also a space for interaction with nature and offers the benefits of hands-on participation with the plants and the soil. It has accessible paths, raised beds, and a lawn for group activities. 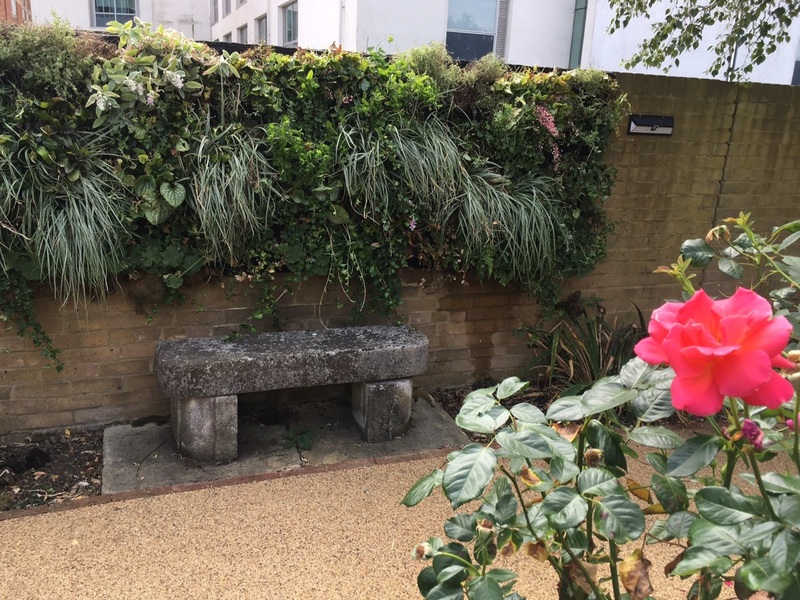 “The idea is that being in nature, observing it is fascinating: it absorbs you but not like the concentration of work” says School of Health and Social Sciences honorary technician and Wellbeing Garden curator Peter Jarrett. Leading living wall designers Scotscape made the installation possible using their fabric living wall system, with easy to access integrated irrigation. They approached the project with the highest levels of care and enthusiasm throughout, fitting the wall with all the necessary materials at no additional cost. The University has had a connection with bee-keeping since 2014, when hives were placed on the roof of the Grove building at the prompting of a project by Fine Art mature student Lucia Stone on bees and their life-cycle, in partnership with Barnet Beekeepers. Growing out of this, the Urban Hive Archive research group explored the bees’ territory and biodiversity it sustained, travelling to Milan in 2015 for a collaborative workshop about urban ecology and sustainability through art and design practice. Middlesex produces its own honey each year from the Grove building hives, which goes on sale in the winter. Middlesex’s association with River of Flowers goes back to the organisation's foundation in 2008 at Archway Herbal Clinic, which then offered clinical practice training to Middlesex students on herbal medicine courses. It held its first conference at Middlesex the same year. There are now 31 Rivers of Flowers – trails of wildflowers and trees through cities to attract pollinators – across the world, including in New York, Dubai and Singapore. For the past three years, River of Flowers has been promoting the Honeycomb Meadow model of movable hexagonal planters as a solution to turn urban “deserts” such as grey concrete squares, amenity grass areas and bitumen rooftops into rich forage territory. Founder and director Kathryn Lwin is an environmental optimist. “I believe that we are moving towards a time of greater harmony between people and nature" she says. "Together with intelligence and in moderation, by sharing resources and great ideas such as reaching up to the sun for its inexhaustible supply of energy, we will solve the greatest problems facing the world”. The living wall links to other projects at Middlesex seeking to promote wellness through the physical environment. "Showcasing the garden is a great opportunity to raise awareness of some of the many benefits which can be generated by urban green spaces" says Middlesex Professor of Environmental Science Lian Lundy. "It fits well with the Campus Living Lab project: a cross-faculty initiative [looking at] how students and staff engage with – and can ultimately benefit from – using green spaces". And Deputy Dean of Health and Social Sciences Dr Richard Beaumont says, "What a wonderful opportunity to have a display from Chelsea Flower Show at Middlesex, as part of our desire to provide vibrant and exciting welfare spaces”.